When installing a new VoIP System in your office, institution, or plant, it makes sense to extend the system to include mass notification. In today's world, a mass notification system is necessary, especially in schools, malls, and large campuses. If you don't already have an analog speaker system in place, extend your VoIP System that last mile to include IP Speakers as SIP endpoints. Valcom, Cyberdata, and Advanced Network Devices offer IP speakers which connect to your VoIP system as if they were another VoIP Phone or through zone controllers to give you control over where your message is extended to. To extend your reach, IP speakers can be connected to less expensive analog ceiling speakers allowing you to use your VoIP system to communicate while saving costs on speaker hardware. VoIP Supply offers a wide variety of IP ceiling speakers including industry standard 8in round ceiling speakers, rectangle drop-in speakers for false drop ceilings, as well as wall mounted speakers and intercom systems. Unify your messaging by combining your IP speaker system with a network clock or an IP digital message board. Choose from industry leading manufacturers Advanded Network Devices (AND), CyberData, and Valcom to design the perfect system for you needs. Whether your application for indoor or outdoor use, VoIP Supply has the IP speakers you need for the most complete notification network you can imagine. The CyberData 011039 Conduit Speaker Mount is for installation of the CyberData VoIP Ceiling Speaker. 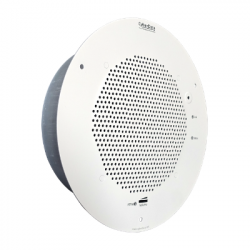 The CyberData 011200 is a PoE VoIP drop-in Syn-Apps enabled ceiling Speaker that connects into your network with a Cat5 cable for public address capabilities. The CyberData 011201 is an Analog Auxiliary Speaker. 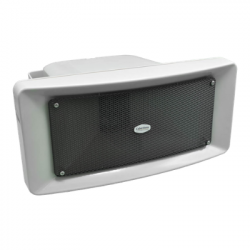 This Drop-In Auxiliary Speaker is an option for the CyberData SIP Speaker to extend the coverage area. The "Drop-In" design combines easy installation with a streamlined look. 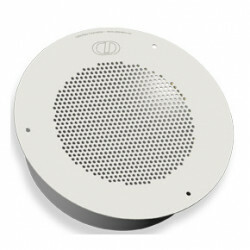 The Gray White CyberData 011104 Syn-Apps Enabled VoIP V2 Ceiling Speaker is for use with the Syn-Apps SA-Announce notification system. 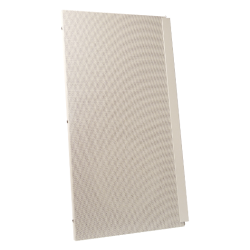 The Signal White CyberData 011105 Syn-Apps Enabled VoIP V2 Ceiling Speaker is for use with the Syn-Apps SA-Announce notification system. 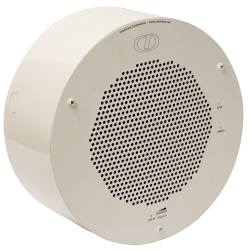 The new CyberData VoIP Outdoor Horn IP66 Speaker provides an easy method for implementing a loud IP-based overhead paging system for loud areas, warehouses, manufacturing areas, and outdoor areas. The new Singlewire Paging Amplifier is for use with Singlewire's paging and emergency notification software InformaCast® or InformaCast CK. This PoE-powered device now includes some brand new features such as dual registration for both Singlewire and SIP, and hooks up easily to new and existing Singlewire installations, providing an easy method for implementing a loud IP-based overhead paging system for loud areas, warehouses, manufacturing areas, and outdoor areas. CyberData's new SIP Talk-Back Speaker enables two-way conversations in settings such as classrooms, offices, medical facilities and clinics. The CyberData SIP Speaker is compatible with most SiP-based IP PBX. 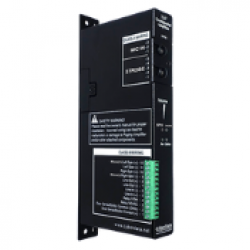 In a non SiP environment, the speaker is capable of broadcasting audio through Multicast.